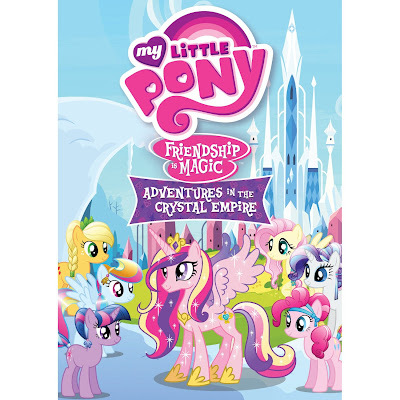 My Little Pony: Friendship Is Magic – Adventures in the Crystal Empire is priced at $14.97 and is now available for purchase! By now you all know that I have a huge fan in our household when it comes to My Little Pony. This has been going on for years and now that we get lots of opportunities to review the Friendship Is Magic series on DVD, my daughter has become an even bigger fan. Adventure in the Crystal Empire had to be one of her favorites so far. Not only is this DVD filled with an hour episode, but it's also filled with adventure lessons to be learned and best of all, friendship. All things I absolutely love about the My Little Pony television series. Not only was she able to watch the Adventure in the Crystal Empire episode, but there were also two other extra episodes she enjoyed along with the bonus of coloring sheets and sing-a-long on the DVD, which she loves. I'd definitely recommend this DVD to any parent who has a little girl, if they've never watched My Little Pony before they will certainly end up a fan by the end of it. Thanks to The Shout Factory you can download and print this free coloring sheet for your little girl to enjoy! Disclosure: All opinions are my own. I received the My Little Pony Adventure in the Crystal Empire DVD at no cost for the purpose of this review. No other compensation was received. A big thank you to the PR company for providing the giveaway prize!